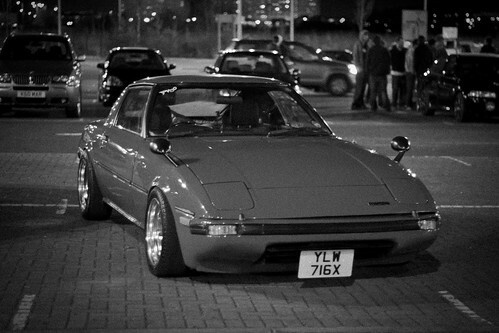 Found this photo that was taken around Spring time, my car parked up at a local car meet..
Re: My SA22c from earlier this year.. I was running 30mm hub adapters in that photo. Wheels are 15x6.5 +18 up front 15x7 +11 on the back. Grear looking car mate and relocating the wing mirrors was I great job 'i thought of doin that to my old fd but never got around to it ' what mirrors are they ? That looks great! Love how it sits, what's your suspension set up? Got me really contemplating the fender mounted mirror ! Dan Dillinger wrote: I was running 30mm hub adapters in that photo. Wheels are 15x6.5 +18 up front 15x7 +11 on the back. What's the clearance going to be like with the 8's on the rear? The Series 3 is ET40 stock, whereas yours is ET20 - If you swap the front suspension you will add track to the front, what are you doing in the rear? If you swap in the diff, once again you will gain track width. JayoM wrote: That looks great! Love how it sits, what's your suspension set up? I had it sitting on "custom" springs there. Got Bilstein coilovers front and rear going on this year though with cusco top mounts.